roads back to Twee Rivieren camp where we would be spending the night. We had decided that we would visit the 'bird hide' which we had tried the previous evening as it is easily accessible from the camp and despite it still being dark at just a little after 5am we would have the benefit of the 'floodlight' as the generator came on at 5am to light up the waterhole. The temperature had dropped dramatically from the previous days and the wind had picked up quite a bit as we made our way to the hide, again we sat there for just over an hour and nothing to show for it as we shivered in the cold, as others arrived with hot morning coffee. We decided to head back to our chalet and get the car packed and have breakfast before setting off. We left through the 'south gate' just after 7-30 am and as the sun was rising we noticed a lot of cloud cover in the sky, the cooler weather we were expecting a few days earlier had arrived. Our first stop on the way out of the Kgalagadi Transfrontier Park and back to Twee Rivieren would be 'Dikbaardskolk picnic spot', the picnic spot we had stopped a few days previously on our way from Kalahari Tented Camp to Nossob. This time no sociable weavers (Philetairus socius) nor people, and our coffee and rusks had to be had sat in the car as it was so cold and windy. and Black-backed jackal along the way. The cloud cover gave our photographs a soft diffused light instead of the golden yellows and oranges we had experience previously. 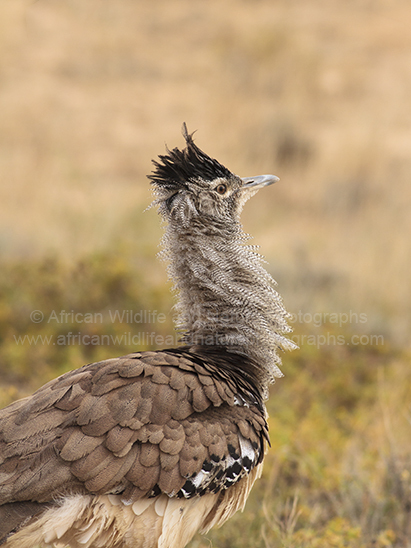 Something worth noting though is that virtually around every corner so far that morning we had caught sight of the worlds 'heaviest flying bird' the Kori Bustard (Ardeotis kori), around 10 in total. I don't think we'd seen this number in total in a year in the Kruger National Park. Apparently its due to the secretion of 'gum' from the prevalent 'Blackthorn Bushes' in the area. We were fortunate to see a male in a semi mating display (neck feathers extended). 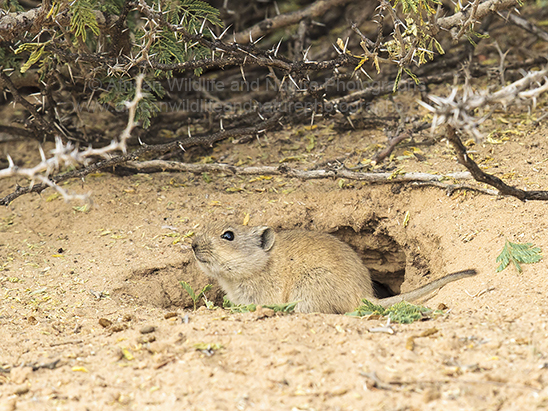 The Kgalagadi Transfrontier Park although famous for its 'lion' and 'birds of prey' has of course many other much smaller mammals that inhabit this stunning arid landscape and we were lucky to see one of theses little inhabitants going about its daily business; a rodent called a Brants's whistling rat (Parotomys brantsii). 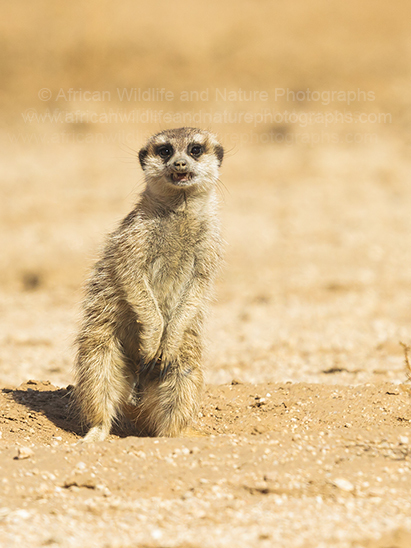 Just after our second picnic stop at 'Melkvlei' (still to cold and windy to get out and have coffees and a sandwich) we came across another quite famous inhabitant of the Kgalagadi Transfrontier Park, a family of Meerkats or Suricate (Suricata suricatta). This family entertained us for quite a while, whilst we sat in the car watching and photographing their antics. Having passed the (famous for its big cats) 'Kij Kij' waterhole (again very quiet) we arrived at the Twee Rivieren camp by mid afternoon our stop for the night and the gateway to the Southern Kgalagadi Transfrontier Park . We checked into our chalet and unpacked the car, as the power doesn't go off in Twee Rivieren unlike the rest of the park and as it was quite chilly in our chalet it was time to bring out our little 'fan heater' we had brought all those kilometers with us from home. We decided not to go out again that day except to the shop to pick up some water (we had used all the water we had brought with us) and catch up on any emails as we now had a 'signal' after several days without contact with the outside world. We had planned to go back to the nearest waterhole at first light in the morning before leaving the park and heading home. 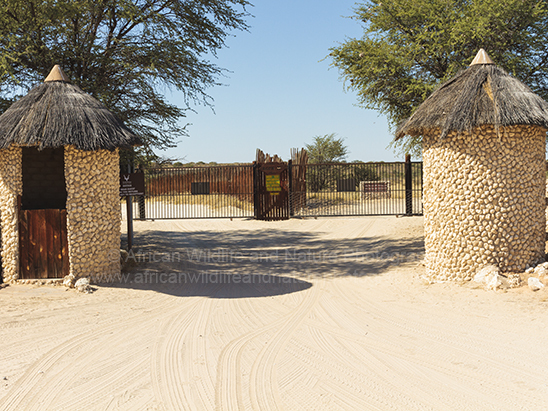 We rose early the following morning so we could make a dash at first light for the 'Samevloeiing' waterhole just a few kilometers inside the Kgalagadi Transfrontier Park gates after entering at Twee Rivieren. What is said about 'best laid plans' etc.... We were met with minus 3 degree temperatures and our 4x4 which had carried us over 2000 km to date would not start. It took another hour and a half and a 'thick' set of jump leads from our neighbours to eventually get us going. What shall we do? pack and leave or head for the 'waterhole'? morning drink and in came the Namaqua Sandgrouse, followed by the Burchell's Sandgrouse weary as ever. The time was moving on and we had to check out at Twee Rivieren by 10am, but the Kgalagadi Transfrontier Park gave us one last surprise before we left, 2 lifer's (birds never before seen). A juvenile Black Harrier (Circus maurus) and a Red-necked Falcon (Falco chicquera) were doing aerial battle just above us, the Harrier we believed was some distance out of its range for that time of the year. We reluctantly made our way back to our chalet in time to complete the packing and head to the garage to 'pump up' our tyre's back to normal road pressures (when you drive on soft sand tyres need to be reduced in pressure). Final check out at Twee Rivieren gate and we were on our way back home, some 1500km. Kgalagadi Transfrontier Park had given us a week of outstanding wildlife experiences and photo opportunities, with over 25 'lifers' for us, we hope you have enjoyed travelling along with us and we hope we have given you all just a little taste of what you can experience in this wildlife wilderness and area of outstanding natural beauty. One last tip, if you are wishing to go to the Kalagadi Transfrontier Park and experience it for yourselves, then BOOK EARLY, nearly 11 months in advance to ensure you are not disappointed.